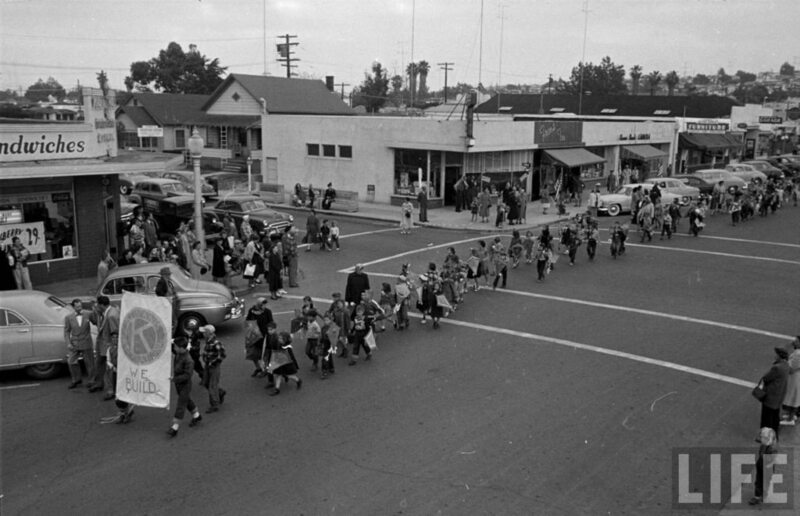 OB's 4th Annual Kite Parade down Newport Ave in March 1951. Photo for Life mag by Edward Clark. I retyped the words as spelled, and included all punctuation as it was written. I made just one correction where Ocean Beach was written as Oceanbeach in the first paragraph. I figured it was a mistake in the magazine editing. I’m fairly certain the cottages were near the NE corner of West Point Loma Boulevard. Condos now occupy that space. Were they beatniks? Commies? What sort of “community gatherings” did they have there in the early fifties? One can’t help but wonder. Hundreds of cars go roaring down West Point Loma Boulevard everyday, blissfully unaware that behind a certain high hedge, there nestles a little spot of historical interest, a vestige of the “Ocean Beach” of yesterday. To the tenants that live there, it is a bit of Shangra La. Here on the bank overlooking Mission Bay and the sea, cling our little redwood cottages, giving the impression of growing from the earth, buried deep in the tropical growth. To us who live here, we wouldn’t trade them for all the modern chrome, steel and porcelain “modern apartments” in the world. Our plumbing is modern and well behaved but the pipes are a chaotic arrangement that stick out like ribs down the back of the cliff. But nature is kind and has tried to shield their nakedness with vines and wild growing nasturtium and geranium. Much of the structure of our homes is the “added-from-time-to-time variety”, but I say it kindly since time has dealt kindly and mellowed the adding of a wing here or a room there while the sea wind has beaten and blended all with a harmony of tone __ unkindly called “weatherbeaten.” To us, this means beaten by the elements we love: salt spray from the sea and winds blowing across the wide open expanse of sand below us. Beside my house is the “Hunting Lodge,” a name now lost in history and the progress of our city. But there was a time when it played an important part in the live’s of men who came out by street car for a day of sport __ game hunting in the marshes that once lay before us. No doubt many a tale was spun here. Now the street car track and trestle that bore them to Ocean Beach is no more, submerged under tons of sand, the result of dredging to create Mission Bay, the Million Dollar Playground. One of these days man will be playing golf or dropping his coke bottle where once the snowy white egret, the mud hen and the duck preened their feathers or swam undisurbed in the shallow lagoons winding thru the marshes. So close to the road are we that many times we have born the brunt of passing motorists who miscalculated their speed on the slight curve tha begins by our houses. The Lodge has been run into and rebuilt many times, with even the fireplace being torn asunder by man’s feverish wish to get where (?). Now guard rails protect us and we sleep more soundly. No longer are there marks to show it, but one little house formerly had winding steps leading to a minature dock to which a rowboat was always tied. Many a pleasant journey was taken leisurely in this boat, winding in and out of the lagoons to the sea, a mile distant. Behind my house is the “Crow’s Nest,” a tiny apartment with a tiny fireplace but furnished well with brass and copper. It’s major asset is an unsurpassed view of distant mountains, level upon level of blue and purple. At sunset, the red glow of the sun’s reflection shines from the windows of Clairemont, high upon the hills, another evidence of the city’s phenomenal expansion. And from the window, one sees a scene lika a Japanese painting framed by the long arm of a cypress tree. Tropical growth surrounds us. Little fish ponds appear in surprising places but if that weren’t enough, the largest house of all (our pride and joy) has palm trees growing through the roof of a room filled with treasures of the south seas and of Malaya. There is an exotic air in this room where gourds, beads, jungle mats and strange weapons grace the walls. But its bizarness is modified by a rock garden in one corner of the room. At the bases of the palms, grow minature gardens, while one looks up through a glass roof to the sky above. My own little house has a long branch of driftwood fastened rakishly across the front of it. A composition, but very real looking pidgeon, or white dove, sits upon my roof and gazes sightlessly at the traffic. From the pergola beams in front fall vines that give a lacy pattern against the house when the sunshine flickers throught the leaves. Among the vines hangs a big brass gong from far distant China. At night one goes to sleep listening to the tinkle of the little glass windbells. Inside, I have a pleasing but motley array of treasures, a cuckoo clock from Germany, a little clock from Tokyo, a dog that rolls his eyes with each beat of time. I have rare porcelain, opium pipes from Shanghai, portraits from Japan, well worn books upon the shelf, and red and green candles that flow like jewels at night when friends set around just talking or listening to music. Our community gatherings and our environment make us feel very rich indeed __with friendship and contentment. I love reading about the history of O.B., and would love to know the exact location of this community. I’m guessing it’s either near the entrance to the last baseball field on Robb Field (near the old pumphouse by the Abbott Street spur), or across the street from Lotus and West Point Loma, by the hotel pool. Anyone know which one it is? Or another one altogether? If anyone is looking for an expression of the soul of my community they go no further than; “One of these days man will be playing golf or dropping his coke bottle where once the snowy white egret, the mud hen and the duck preened their feathers or swam undisurbed in the shallow lagoons winding thru the marshes.”- L.S. Nice touch, Larry, and thanks for keeping your eyes pealed for such enlightening nostalgia. You recognize that corner, don’t you? Newport and Cable. My uncle’s camera store was the third storefront from the corner on the north side of Newport, with a low red, brick front. Not certain when he opened it up, but I know it was there by 1956. Check out this picture of Newport and Cable, taken from Google Street view. No doubt is is the same corner. Thanks Patty for adding the present-day image. I had no idea that the house on Cable was still there. No photos accompanied that 1953 magazine article, so I can only guess the location of the cottages. West Point Loma Boulevard winds and curves, because it conforms to the geography of the area. I’m sure there was more than one house with a rowboat dock out back. Perhaps even the two houses in the 4800 block that are currently on developers Death Row. The only North OB house I’ve ever seen that had a large palm tree in the living room, was just East of the NE corner of Nimitz and W. Pt. Loma Boulevard. Some folks might not consider that Ocean Beach, but the percieved border of Ocean Beach has changed over time, because of planning groups and realtors. When I was a kid, the Famosa Slough and the roadside fruitstands just beyond there marked the frontier. The old cottage with the palm tree was inside the border of Ocean Beach as far as I’m concerned. About how far east from that NE corner of Nimitz and WPt loma? A palm tree in the living room? Must have been a helluva room! Yes, you’re right – there were several “boat houses” just west of the intersection of WPt Loma and Sunset Cliffs. At least one – since remodeled of course – still stands. And yes, I do believe they are on the demolition list. I should specify that the palm tree wasn’t in the room. Rather it grew through the room….up throught the floor and out the ceiling. I was just there once for a party about 1970. Talked to a screenwriter. Don’t remember his name. The NE corner has always been a huge sand lot. Are you discussing the old house on the hill up the road – WPL? PS…I was just kidding when I questioned whether they were beatniks or commies. They may have been writers and artists. Perhaps war-weary folks that just wanted to settle into the Tikii Era. That 1953 magazine contained an ad for the newly opened Christian’s Hut (later renamed the Bal Hai), and an article about the new Kona Kai Club. One thing we know for certain is that Lois says they were tenants. Renters trying to preserve a vestige of old Ocean Beach…more than half a century ago. I got curious and went to have a look. The building that’s there now is concrete block and comes out flush with the corner building. I wish it was it’s so cool. I would like to think buildings like these would be protected today. Late teens or twenties built solid. Mark, many of the craftman style homes along West Pt Loma from Sunset Cliffs (Defoe) down to Bacon St. had boat houses. I once knew an elderly gentleman who was born in one of them and used to row his boat out into the marsh when he was a young boy. Robb Field is landfill, false bay came right up to the back of these homes (at least during high tide). If you love OB history hope to see you out at the next OB Historical Society meeting on Thursday February 18. Check out http://www.obhistory.wordpress.com . Pat, looks like an interesting event. It’s about the 13 young servicemen who drowned in one afternoon trying to walk or swim to OB from the south Mission Beach sandbars. During WWI, I believe. A very tragic event. And the City had no life guards at the time. Pat, it is sooo close, dude. The roof lines are almost exactly the same. You’re probably right, though. But check out the second story – different type of construction. Did they totally demolish the old house? How much distance between the concrete front and the second story? Your right the roof lines look similar, that’s why I took a walk down to see. Both first and second stories are flush with the corner so it’s apparent it’s all different construction.